John Gargus was born on June 18, 1934, in Velka Poloma, Czechoslovakia, and escaped with the assistance of his parents in 1949 to join his grandmother in the United States. He was commissioned a 2d Lt in the U.S. Air Force through the Air Force ROTC program at Bowling Green State University on June 10, 1956, and went on active duty beginning November 4, 1956. Lt Gargus completed Navigator Training and was awarded his Navigator Wings at Harlingen AFB, Texas, in May 1958, and then served as a C-118 Liftmaster navigator with the 1611th Air Transport Wing at McGuire AFB, New Jersey, from June 1958 to December 1963. His next assignment was as an instructor with the Air Force ROTC detachment at Texas A&M University from January 1964 to March 1967, followed by service as an MC-130 Combat Talon (Combat Spear) navigator and mission planner with Detachment 1 of the 314th Tactical Airlift Wing at Nha Trang AB, South Vietnam, from April 1967 to August 1968. 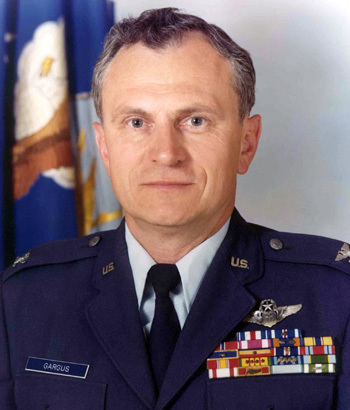 Maj Gargus then served as an MC-130 Combat Talon (Combat Knife) instructor navigator with Detachment 2 of the 1st Air Commando Wing at Pope AFB, North Carolina, from September 1968 to June 1972. During this time, he participated in the Son Tay Raid to rescue American Prisoners of War being held in North Vietnam on November 21, 1970. He served as the lead navigator for the assault force and also helped plan the mission. His next assignment was as an MC-130 Combat Talon (Combat Arrow) instructor navigator and Chief of Plans for the 7th Special Operations Squadron at Ramstein and Rhein Main AB, West Germany, from July 1972 to June 1974, and then as Deputy Base Commander of Zaragoza AB, Spain, from July 1974 to June 1977. Col Gargus next served as Deputy for Readiness and Deputy Base Commander of Hurlburt Field, Florida, from July 1977 to October 1978, followed by service as Assistant Commandant of the Defense Language Institute's Foreign Language Center at the Presidio of Monterey, California, from November 1978 to August 1981. His final assignment was as the Chief of the U.S. Air Force Mission to Columbia, where he served from September 1981 until his retirement from the Air Force on August 1, 1983. During his Air Force career, Col Gargus accumulated over 6,100 flying hours and was authorized to wear Master Navigator Wings. After his retirement from the Air Force, he worked as Director of Maintenance for the Austin Independent School District in Austin, Texas, from 1983 until his retirement in 1998. John published the book The Son Tay Raid in 2007. He was inducted into the Air Commando Hall of Fame in 2003 for his work on the evolution of the MC-130 Combat Talon navigational systems and for introduction of the new systems as a manual writer and crew instructor. Major John Gargus distinguished himself by gallantry in connection with military operations against an opposing enemy armed force during the Prisoner of War search and rescue operation at Son Tay, North Vietnam, on 21 November 1970. On that date, Major Gargus participated as Lead Navigator in a combat flight which led a force into Son Tay. In the face of heavy enemy antiaircraft artillery and surface-to-air missile fire, Major Gargus skillfully managed all navigational systems and equipment to insure precise navigation and accurate timing on target which were essential for completion of this dangerous mission. As a result of Major Gargu' heroic efforts, the force arrived at Son Tay without incident, the enemy ground forces were completely surprised, and the mission was successfully completed. By his gallantry and devotion to duty, Major Gargus has reflected great credit upon himself and the United States Air Force.